In the last 5 years, I had the chance to look at many products which are targeted at others startups. Unless your product is an absolute utility (MailChimp, AWS, Google Analytics, Launch Rock or Survey Monkey), I’d say avoid this market with products that cost money. 1. Startups tend not to have a lot of have no money. 2. Startup founders believe they can “build your product themselves” and it will cost them much less and only need 10% of your features. 3. If they end up paying your churn rate (number of customers who wont renew) will be large since many will shut down. That said, if you still believe you want to do this, then I put a framework together for you to think about your pricing and business model. The two main criteria for thinking about this is time and money. Your customers either have lots of them or none at all. What I have found is that if your customer has no time and no money (typical of engineering teams or hackers at startups), then the only solution that works will be a “free” or open source. Some times you might want collaboration features (Slack) for which people might pay, but it is rare. When your customer has money, but not time (Customer acquisition and User Growth hacking teams) they will tend to pay, and freemium models work very well here. E.g. Mailchimp or Intercom. When your customer has lots of time but not money, they will likely do it themselves, so only ad supported models work. Most products aimed at founders end up in this bracket. 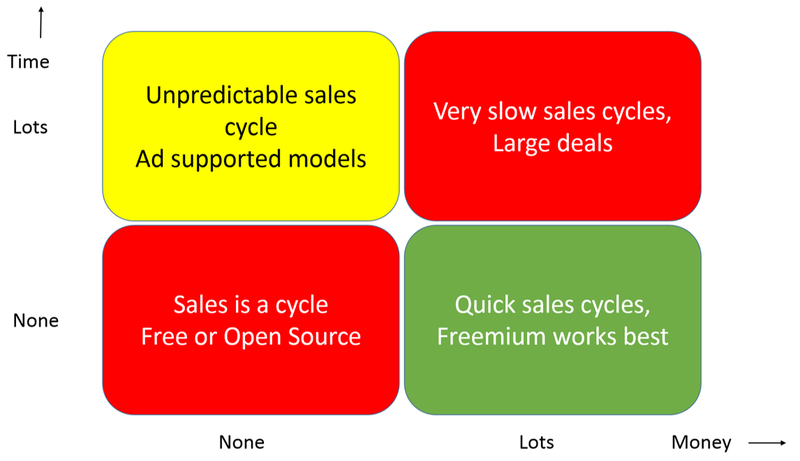 The sales cycle is very unpredictable and it is likely the customer is not going to pay. Finally when the customer has both time and money (I dont know any startup that does), the sales cycles are extremely long. The deals will be large, but you will be expected to hand hold the customer and hire a sales person to “sell” them the product. Another way to think about the model is the type of sales model you want to adopt. If your customer has no time or money, expect to only get customer via word of mouth, otherwise, your model wont support the LTV since there’s no value in the LTV. You CAC (Customer Acquisition Costs) need to be as close to zero. If your customer has time, but no money, you should still not hire sales people but put social features into the product to help enable virality and word of mouth. If your customer has money, but not the time, you can actually spend money on advertising, using Facebook, SEM and other techniques to acquire customers and have an inside sales team to help close. If your customer has time and money, you will need to hire a field sales team and expect the deals to be much larger in size. You will likely have to create a lot of collateral and sales tools to support them through the sales cycle. Excellent post, Mukund. In your opinion, is a full-service accounting automation product an absolute utility for startups? VishalIt will if the company is making money or has revenues. Else it is a nice to have. Could not agree more. Problem is, defining ‘utility’ is hard to do.